A classic analog recording studio. Fry Pharmacy Recording opens a location in Memphis, TN. Although Fry Pharmacy Recording is still operated as a production studio in Nashville, the new larger main studio will operate under the new company name, Memphis Magnetic Recording Co.
Memphis Magnetic Recording Co. (MMR) is a recording studio that focuses on analog recording techniques and equipment. 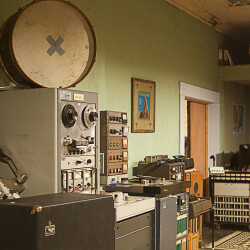 We seek to preserve the recording techniques of the classic recording studios of the pre-digital music business. Our customers are musicians interested in utilizing the equipment and techniques used on albums made in classic recording studios of the 1950’s, 60’s and 70’s. As engineer / producer Scott McEwen enters his second decade in business as a recording studio owner, he has relocated his main studio from Nashville, TN to a larger and newly renovated 1920’s building in Memphis TN. This new studio is a “purpose built vintage” recording studio, designed by Suffolk Studio Design. This move, comes with a change in studio name to a more fitting Memphis Magnetic Recording Co. McEwen, also operates Fry Pharmacy Recording in Nashville although not in his original location. Scott McEwen is the managing partner in Memphis Magnetic Recording Co. Scott owned and operated the Nashville recording studio Fry Pharmacy Recording from 2004 through 2015. Fry Pharmacy was a internationally known analog recording studio with clients from all over the globe. Scott is well known in the Music Business and in addition his work as a recording engineer/ producer he is a professional bass player. As a bass player, he is best known for his years as a member of the The Tarbox Ramblers. He also has played bass for Robert Plant amongst other top names in the roots music world. Currently (as of November 2017) Scott has a current record production (JD McPherson’s, Undivided Heart and Soul, on New West Records) charting at #1 in the Americana Radio Charts for three weeks and it currently stands at #3 on the Billboard charts. In 2017 Memphis Magnetic Recording Co. bought 618 Vance ave in Memphis and is renovating this building into a world class “vintage inspired” recording studio. “As a musician, producer and recordist, I have always loved spending time in Memphis, the quality and feel of music that has been recorded there has an undeniable pull to it, not only for me, but for music fans across multiple genres. The great Memphian author, Hampton Sides, says in a recent essay trying to define the undefinable allure of Memphis “The thing about Memphis is that it’s pleasingly off-kilter. It’s a great big wack job of a city. The anti-Atlanta or new Nashville. You can’t believe the things people will say, the way they think, the wobbling orbits of their lives. There’s an essential otherness. When you look at an image by William Eggleston, a Memphian and one of history’s greatest fine-art photographers, you get a sense of what I’m talking about: warped perspectives, angles that make you question your assumptions. “I am at war with the obvious,” Eggleston has said. Maybe it’s the river, maybe it’s the ribs, maybe it’s the music or something else. Whatever it is, the South’s capital of Soul has a way of bewitching you”. In the early days of McEwen’s Nashville based recording studio, the great session bass player Jimmy Johnson, remarked after his first session at the old location, that he “felt like he was 23 again working at Stax and that McEwen created the ‘Most Memphis Studio in Nashville”. Says McEwen “Honestly, I never set out to do that, my recording studio was not a contrived, retro “let’s try to be 1957” type of thing, it was just set up the way that I believe records are meant to be produced, with people in a room playing music together, moving the air molecules as a unit and captured onto magnetic tape with all of its glorious advantages and limitations”. When Jimmy Johnson expressed his observations that day, McEwen actually knew in his heart that, this statement was going to be a foreshadowing moment in his life and therefore took his observation for the old studio motto. Not only to remind himself, but to let others know that he records in a different method than 90% most modern recording studios. 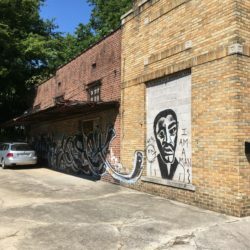 After 11+ years in business in Nashville, McEwen finally succumbed to what he always knew in his heart, and the magnetic pull of Memphis and found an amazing and very cool, untouched and fabulous building built in the early 1920’s right off Downtown Memphis, 3 city blocks off of Beale Street. Memphis Magnetic Recording Co.’s new building (an old bank) is actually quite similar in structure to the old 1920’s Fry Pharmacy in Nashville. Those who have recorded with McEwen in the past will feel at home, but appreciate the newly designed purpose built vintage studio. The new studio is designed and built by famed English recording studio designer, Bob Suffolk. Mr. Suffolk’s roots reach back to his early days at working at Abby Road, Trident, Pye and other classic UK recording studios. Bob has been living and designing in the United States for over two decades and has designed for over 35 years now. Suffolk’s studio designs are some of the best sounding and translating rooms in America. For a recent example of his work see….the fabulous sounding Niles City Sound that he designed for Leon Bridges and Co, in Fort Worth, TX. 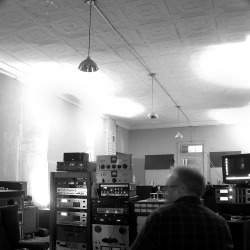 The newly minted, Memphis Magnetic Recording Co. takes all that Scott McEwen, built in his previous location in Nashville – his world class analog recording equipment and tireless recording work ethic, and sets down roots in a vibrant and some say magical (birth place of Rock n Roll, anyone?) area of Memphis. Memphis Magnetic Recording Co. will have in the near future a band/artist overnight private area (off the control room) and a band bunk house with TV, internet, private secured parking etc. This part of the facility will comfortably sleep 4 and includes a shower, bathroom and changing room and private access to our daytime/evening lounge and full kitchen and not to mention 24/7 access to the large vintage style tracking room and control room that includes natural lighting along with a very cool off control room vocal/tracking booth. This “included” bunk house lodging can factor into the cost of out of town bands coming in to a great cost savings for their project. For other lodging, we also have available an “Art Deco Mansion” that our good friend runs as a semi-private AirBnB for touring bands that prefer to get out of the studio for a couple nights. This is a private, gated estate with a great pool and close to a pretty hip neighborhood. The food and culture and musical heritage of Memphis is undeniable! Please come record, and stay with us, and get that “essential Memphis otherness” on your next record! Fry Pharmacy Recording is a classic analog recording facility that is indeed housed in a old commercial building from the 1920s, the space was re-opened as Fry Pharmacy Recording. We are an analog-centric studio, but we do offer a variety of recording options including digital. The Pharmacy is truly a unique and inspiring space to create and record in. Fry Pharmacy Recording is an “open-air” studio. This means that there is no control room: the machines and engineers work right along side the musicians in the tracking room. This arrangement affords the engineers ease of communication and affords the artist(s) a comfortable setting where they are intimately involved in the process, and not being scrutinized behind a glass wall. By tracking primarily to analog tape, we believe we offer an experience that has become unique in the field of recording. So often with the ability to track infinitely and microscopic editing capabilities, it is easy to lose sight of the goal of most recordings: to capture a performance. At Fry Pharmacy Recording, we believe a band will deliver the best performance when they are comfortable and able to communicate with each other. For this reason, whenever possible, musicians play together in the same room with a clear line of vision between them. All you have to do is play and the fine engineers at The Pharmacy will take care of everything else. We also believe that the ‘limitation’ of 16 tracks is one of our greatest assets, as it forces musicians and engineers alike to be as succinct as possible when it comes to musical and technical decisions (we do however, offer Protools for those projects that prefer or require it). By keeping these ideas in mind, we strive to offer an experience as well as a final product akin to the ‘good-old-days’ of recording. There is a lot to play with at Fry Pharmacy Recording, and many new sounds to discover. Check out our equipment section for a detailed list of instruments and effects. Please feel free to contact us with any questions or to schedule a visit. We look forward to working with you. Recording: Analog or Digital – Live tracking, overdubs, demos, anything – you name it, we’ll help you make it sound great. Mixing/Mastering: Get a fresh set of ears and/or some vintage effects on your record. Transfers: Whatever your tape format, we probably have the equipment to transfer it into digital WAVS. Don’t lose it, archive it! Musicians: Need a particular type of player for your record? We have worked with some of the best – let us help you assemble a band that most fits your needs. We have a long list of quality session musicians on call. Production/Arranging: With all the great tools at Fry Pharmacy let us help you make the most effective use of them. We would love to collaborate with you on any or all creative aspects of your project.